It would appear that Gullet Quarry near Malvern is on most of the wild swimming or outdoor swimming maps. It deserves to be because who wouldn’t want to swim in a pool set in a fold in the Malvern Hills with azure-blue waters (even in December), vertiginous rock faces and mesmerising reflections? 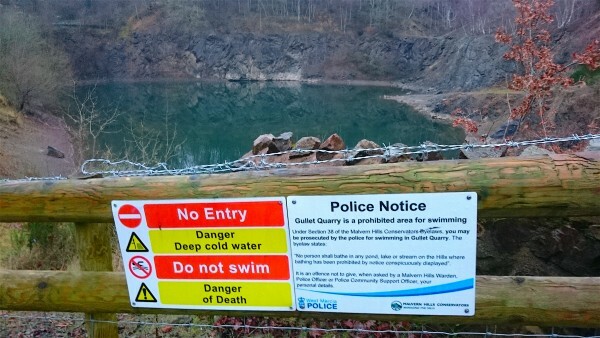 Except that the wild swimming maps are wrong; you can’t swim in Gullet Quarry because it is forbidden. (We’re talking barbed wire and a million signs forbidden here!) There is something, of course, about the word ‘forbidden’ that makes the adventurer in a girl want to do something even more. Forbidden, taboo, banned, closed, refused… they all make me a bit foot-stampingly determined. At least they do until the grown-up Blonde Two takes over and my ‘risk’ voice kicks in. Rules, you see, are usually there for a good reason. 30 mph, always take your compass, don’t drink and drive, SLOW! They are all there to keep us and the people around us safe. 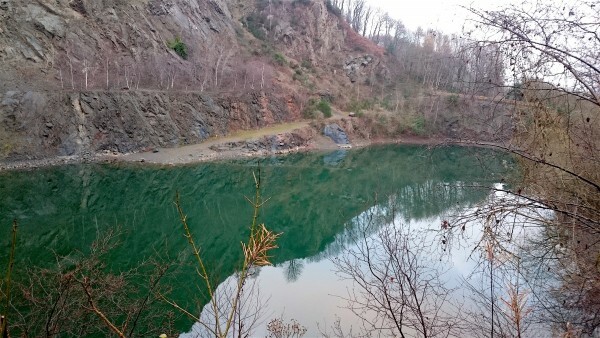 And the same is regretfully true for the Gullet Quarry ‘forbidden’. People have died swimming here, not just because they were drunk or very silly, but because the water is very cold and most of the sides are very steep. This beauty spot is no longer beautiful because it is surrounded by an ugly wooden fence topped with nasty barbed-wire. One could blame the authorities for this (the Malvern Hills Conservators have always been quite strict) or it might perhaps be more fair to blame those who didn’t heed previous warnings. Who I am to say? 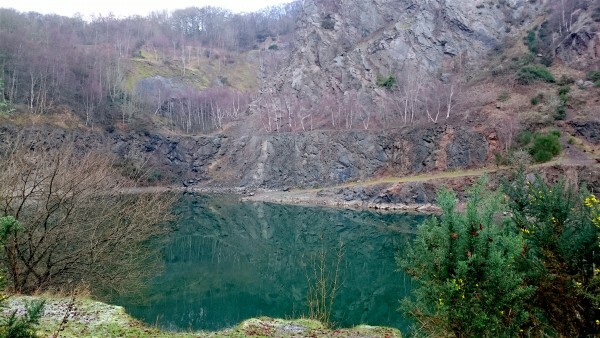 I confess to disappointment when I visited Gullet Quarry (despite knowing all of the history) but sometimes things do happen for good reason and sometimes sensible decisions have to be made. If I swam every day for the rest of my life I wouldn’t have time to swim in all the aqua-beauty spots that Devon has to offer. So I will be grateful for that and leave Gullet Quarry to its deep and ponderous brooding. Hopefully, given time, the fence will blend more happily into its surroundings. At least you can take comfort from the new BBC TV “indents” (the bits of repeated film between programmes that has, in the past, included swimming hippos). These now include a group of oldsters about to do a winter swim in the sea. Yes I know it’s not the same, conceivably the sea’s not wild enough for wild swimming. Film of this kind often appears in the News broadcasts during the winter holidays when real news is hard to come by and I reckon I’m a connoisseur of such clips. The swimmers involved do their damndest to pretend they’re not feeling the cold so there’s no hand-rubbing or arm swinging, no hiding behind a large towel until the final moment. Only a lot of fake brouhaha. But when the camera zooms back out take a look at the swimmers’ postures – arched forward from the waist up, always a telltale sign. Not that I’m jeering, you understand, just observing. Tis my trade. For a month I swam in a lake early each April morning at the Outward Bound Mountain School at Eskdale in the Lakes, and was required to bring out a largish stone after each swim. “Pearl fishing” we called it. Cold water is a mental as well as a physical construct and it’s pleasing to recognise this and to know that one can control one’s own mind prior to the dip. Gullet Quarry doesn’t sound Malvernish, more like Carver Doone territory. We are certainly lucky to have such gentle seas in Torbay (although I have already had a couple of ‘interesting’ moments). I am afraid there is no pretending the water isn’t cold on my part; I make lots of noise as I enter the water! Gullet Quarry is lovely, but fencing is a very difficult problem. Stone walls get knocked down all too fast and can usually be climbed. It would look much better with iron railings with lovely spear-shaped wrought iron tops, but unfortunately, the railings would be stolen very fast; people who will steal drain covers from roadsides would not hesitate to steal a fence designed to save life. Timber fencing is strong, but can be climbed only too easily. Barbed wire is ugly, vicious stuff, but mostly it does not get nicked. P.S. I can recommend a huge number of Lake District Tarns, if you run out of moorland pools!